This is my review of the fascinating story of Josh’s journey from chess prodigy to push hands world champion. Below are some of the highlights of this wonderful read. A friend gave me this book because it is one of her favorites. You can buy the book on amazon Paper back $11.66 or kindle $11.99. His dedication to learning and studying to be great is amazing. I had no clue about the world of competitive chess including the mentors and coaching necessary to excel. He was an athletic kid who discovered chess at the age of six and it was almost as if he understood parts of the game intuitively. Searching for the next bobby fisher. Is a book and movie his dad wrote about him. He tells many a story about his time spent learning and competing in the world of chess. He looked back at some moments in chess he called the “Soft Zones” when he became part of the moment. He studied that and has tips and techniques for creating these moments when necessary. He tells how he dealt with challenges and distractions from music to players kicking him, shaking the board etc. Often he would turn a challenge or distraction into an advantage. Start thinking to the beat of the music, not to react to the kicks by being distracted. Taking a break to go and run sprints or climb stairs to regain focus. He then talks about his downward spiral in chess competitions. I like his explanation of playing chess the way that matched his personality and when he didn’t he didn’t play as well. – so he wasn’t working through his strengths. He notes “pressing for wins in equal positions often results in losing” – you need to really know your circumstances especially after things have changed from one where you were at an advantage and now are not at one. Pressing forward as if you still have an advantage can be costly. How can you apply this to life and business? The film Searching for Bobby Fischer came out when he as 16 – and this added fame as a challenge and distraction. He talks about being present rather than being stuck in time. He speaks about two coaches with very different techniques – one nurturing and the other shock and awe of breaking you down. And moved on to Martial Arts and eventually winning world championships. Once again the dedicated he has for learning and competing is amazing. He has a drive for challenging himself and getting the most out of himself. Then chapter on “Investment in Loss” – you need to be challenged enough that you lose and then learn from it to advance. Making smaller circles. Chapter 11 – breaking things down into small steps – be the tortoise who continues prodding along on your goals. 3 Critical steps in a resilient performer’s evolving relationship to chaotic situations. When it came to competing in martial arts he took a challenge of having a hurt right arm to learn to use his left. The challenge of dealing wit illegal hits lead him to learn ow to deal wit the fear of being hurt and learning to protect himself which took away the opponents advantage of using the illegal techniques. He also learned to concede certain moves of holds thus conserving his energy and putting a wrinkle in the opponents plans. – much like his practicing the end game of chess and thus being better when getting to that part of the game. 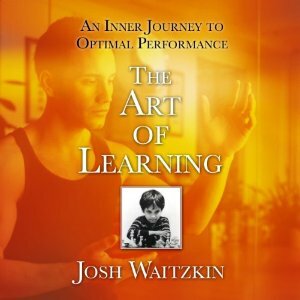 In this chapter he talks about some techniques he learned when he went to the Human Performance Institute formerly LGE in Orlando, Florida. He realized he performed better after a relaxation break – so use time between moves to take a break. Quarterbacks and NBA stars also implemented this. And also a training technique of cardio vascular interval training – getting his heart rate up to 170 take a minute break to get it down to 144 and then go hard again. This helped him with his ability to relax and recover between arduous thought processes in a chess game. He gives techniques for dealing with stress and how to create routines to get into the zone. And how to shorten getting into the zone for all of us so we can turn it on and focus when we need to. Example what is a time when time flies by? Preceding this time add some other enjoyable activities then end with the time you are in the zone. Then you shorten the time spent doing the preceding events and or use those times before you want to be in the zone/attentive at a meeting for example rather than doing the thing you are naturally in the zone doing. Meditation – Thought being just practice it and realize you will have thoughts but release them and come back to focus on your breath. Deals with what to do with your feelings and emotions. Can you do you take those emotions and channel them into a deeper focus? He covers thoughts around anger, ego, and fear.